Today’s Daily Prompt is about Landscapes: When you gaze out your window — real or figurative — do you see the forest first, or the trees? Let’s hit the real part first. When I gaze out of my window I see a cityscape. Not your regular cityscape with skyscrapers and all, but the gentle Amsterdam skyline that seems pretty much the same as it was centuries ago. The trees grew taller, the people inside changed, but the rooftops are still silhouetted against blue skies and scurrying clouds as they were in the 17th century. 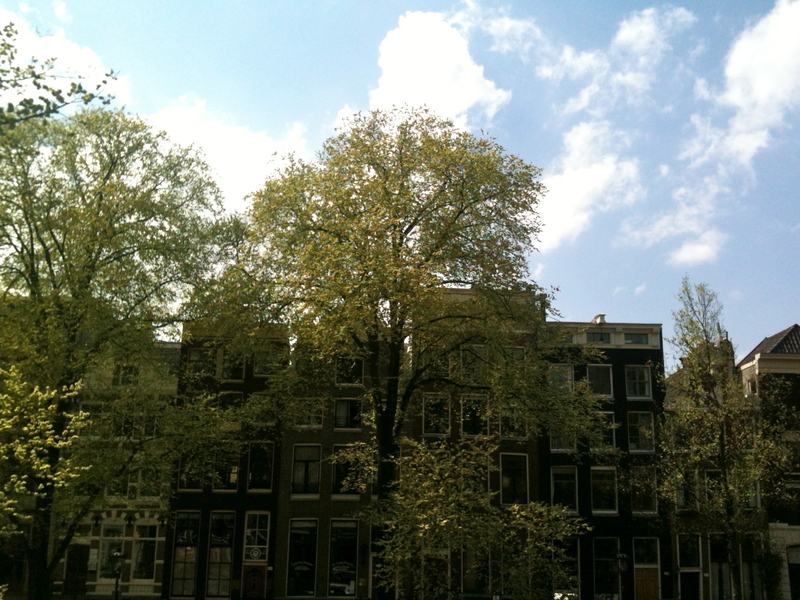 No forest at Herengracht, just trees. Elms. On this spring day, their delicate bud green flowers catch the sunlight in the most amazing way. Diaphanous petals that seem to emit light from within. It won’t be long before they will turn white. Soon after, the elms will shed their blossoms and cause a spring snow. That’s when the figurative part starts, at least in my mind. I envision my protagonist cycling through that storm, trying to elude the bad guy chasing her. Stooped deep over the handlebars of her BMX, she has no eye for trees. Gusts of wind blast clouds of falling blossoms in her face. They stick to her cheeks and forehead, they get caught in her eyes. Every time she skims over her shoulder the shiny black coat and the blue Vespa are right there. She turns and twists her way through the city center, but the guy tails her like a leech. That’s what happens when I gaze out my window. I don’t see a forest or a tree, I see a world of possibilities and stories. What happens if you gaze out your window? Nicely written … when I was little I used to look at photographs and make up stories about the people that were in them – Anyway, just stopping in to see what others wrote about for the prompt – Cheers! Thank you, Shauna. I often use photographs when I teach creative writing. Excellent tools to rock the imagination. PS: I love the Pacific Northwest!